Visual sensation is the most important sensation for human beings as it supplies them with the greatest amount of information about the external world. The physical stimulus for visual sensation is light. Eye is the receptor of visual sensation .Visual sensation is the experience of light in the eye. Through eyes it is possible to see light,color,size,shape,movement,distance,etc. Eye is the organ of vision. It consists of a complex structure.Rays of light enters the eye through the cornea(transparent covering that protects our eyes). 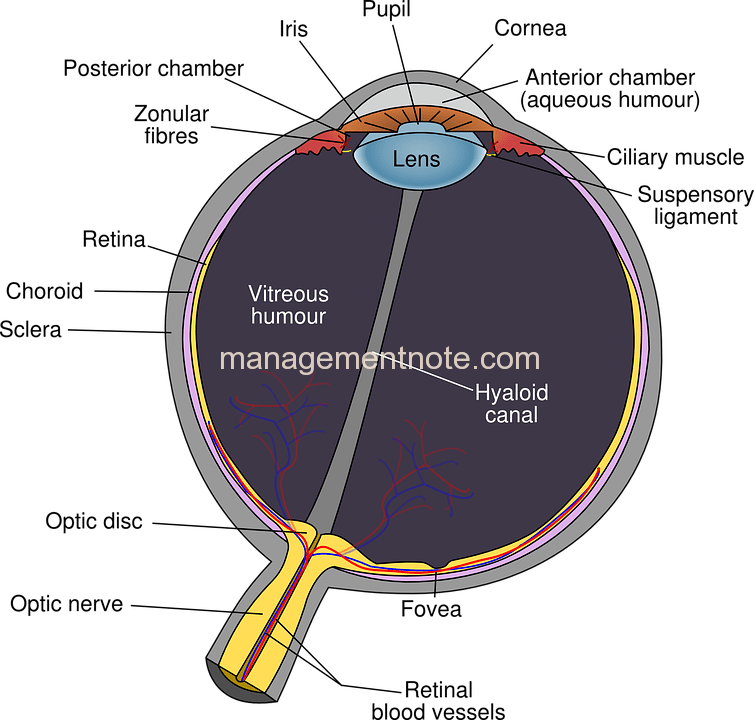 Approximately 3% of the light rays are reflected off the cornea surface and the remaining are passed through the liquid aqueous humor(the fluid behind the cornea) and the pupil of the eye. The pupil of the eye lies in the center of the Iris.The quantity of light that enters the eye is controlled by the size of the pupil which is controlled by the muscles that lie in the inner boundary of the Iris. In dim light the muscles of the iris relax,causing the pupil to open wider to let in more light. In bright light the iris contracts,closing the pupil for cutting down the amount of light entering the eye. Through the pupil ,light enters the lens ,a transparent focusing mechanism which focuses it on a photosensitive surface called the retina lying well inside the wall of the eye ball.The common complaints of near sightedness and far-sightedness are caused by an error in communication between the lens and the retina. The retina contains the receptor cells that respond to light .But before the light can reach the receptor cells ,it must pass through an layer of nerve fibres and blood vessels existing within the retina.Near the middle of the retina ,there lies a blind spot.There are no receptors in this blind spot.The receptors cells in retina are classified into two groups:Long thin rods and short squat cones.The retina is composed of millions of these two types of receptors.Cones are located at the centre of the retina,primarily in an area called the fovea. The cones enable us to see colour.They operate mainly in daylight and are responsible for visual acuity(keenness of vision,the ability to discriminate details and fine differences in the field of vision).The rods,that respond to low illumination are situated on the outside ,peripheral areas.They are mainly responsible for night vision ,the capability of seeing the world. When the light falls at the rods and cones,it activates these light receptors and sets up neural impulses,messages in the form of electrochemical energy.This electrochemical energy from the rods and cones is then sent to bipolar cells and ganglion cells in the retina .In general ,multiple rods and cones are connected to each bipolar cell and multiple bipolar cells coverage on each ganglion cell. The axons of ganglion cells make up the optic nerve . This optic nerve is responsible for sending the electrochemical messages to the visual area of the brain ,where sensation of vision are indicated. This proved to be very helpful for meh……… Thanks alot….. Stay blessed…..!